Grocery shopping on Saturday is never fun but as I worked my way through a local super store this past weekend, I was stopped in my tracks when I came to the craft aisle and spied a load of beautifully crafted yarns and fabrics. I had just received a call from M asking if I could send some warmer clothes to campus as the early morning walk to class had become quite chilly. She asked for her scarves and gloves along with long sleeved fleece jackets. The selection of yarn inspired me to rummage through the colors to find a combination that would match M’s fair complexion and silver/gray winter jacket. I quickly snapped a few pictures of the skeins that I had selected and sent the pics on the M so that she could make the final selection. She decided on the soft blue/green combination and I quickly scooped up her favorite and threw it in the cart. When I returned home, I made my way to the IPad where I watched a beginner crochet video to refresh my limited crochet skills. I watched the video several times and began my project. The basic rectangular shape took about 1 1/2 hours to craft. 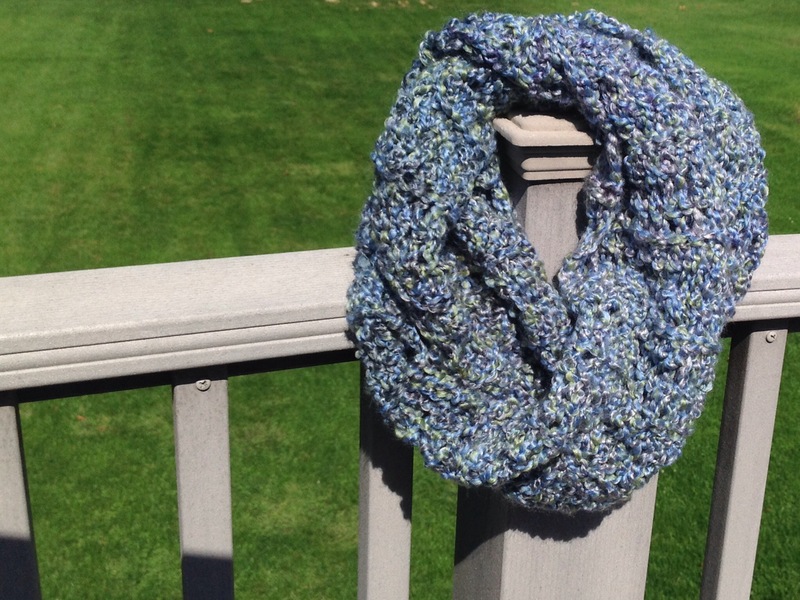 I can’t wait for M to open her care package to find this stylish infinity scarf, that I hope will keep her warm as she makes her way across campus this winter. 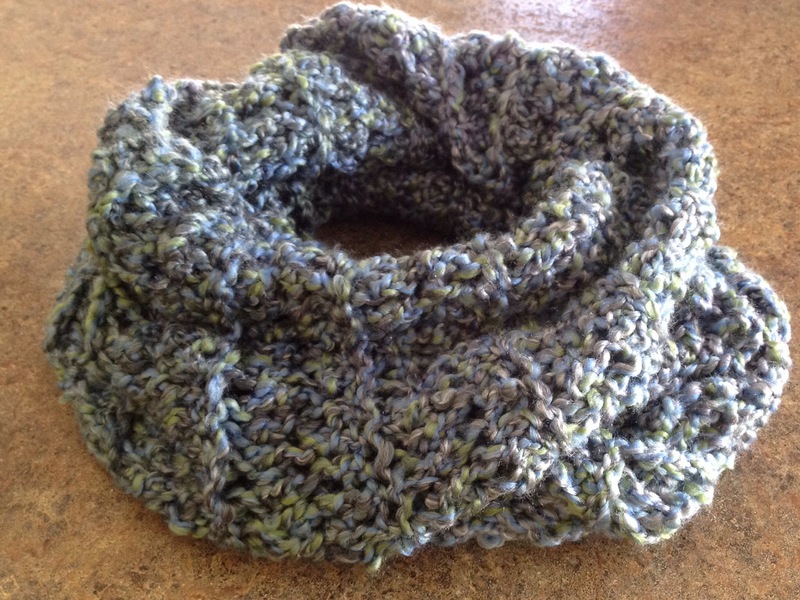 Loved your cowl, Linda! Looks really cozy! This looks lovely, one to try! A really simple project! Hope you get a chance to try it! Thanks for your valued comment. Enjoy your day! This is beautiful! Very nice job, I’m sure she’ll love it! If you click on the highlighted link in the text, it will bring you to the utube video. She did a lovely job explaining things. I am away on business so I will have to find exact link and post it here when I have a chance. Thanks for your comment. It truly is an easy scarf to craft. If I can do it, anyone can! It looks great! What size yarn did you use? Did you double the strands like the instructor in the video did? And did you use a 9mm hook? Thanks for your help! Gosh, I welcome all of your questions but I’m not so advanced to know all of the answers… First, I did not double the yarn because I chose a nubby yarn that seemed to have enough substance to work well for fair or cooler weather. The hook that I used was 11mm. Only because I couldn’t find a 9 mm hook when I was shopping for the yarn. 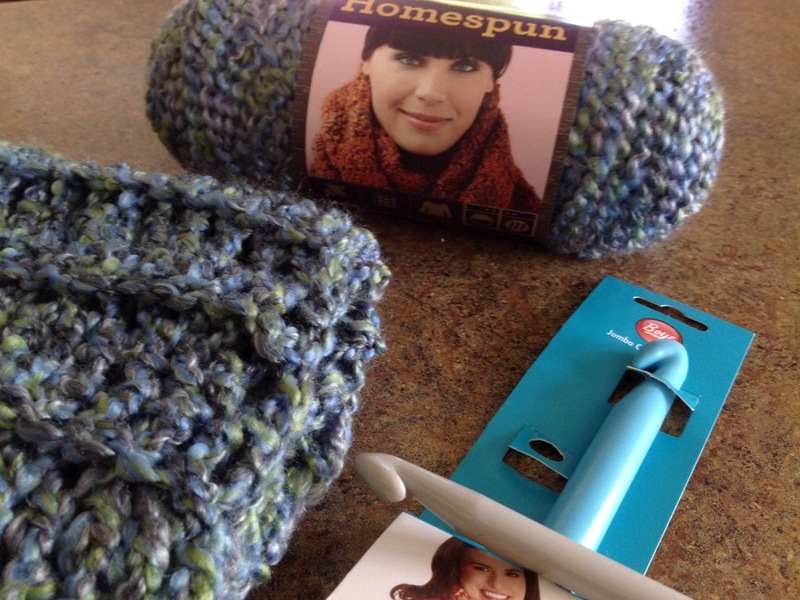 That’s about all I can contribute because I threw out the packaging for the yarn. When I visit the store again, I will report back to you on the size of the yarn. Thanks for your great questions, Elizabeth! Have a great day! Thanks, Linda! My daughter’s birthday is this month and I’m going to try to make one for her. I appreciate your help! Looks very nice, would have not known you were a beginner.